Creative Mathematics is excited to offer a FUN grade-specific two-day work­shop, which is a little shorter and less expensive, than our popular four-day Math Camps. You will be thrilled with the amazing depth and quality of the research-based and grade specific material covered in the two-day workshop! You will work with top-rated national presenters who have created new material to make this an amazing opportunity for you! Barbara Ann Novelli does a remarkable job with Grades PreK-K-1. Kim Sutton will thrill teachers in Grades 2-3-4, and Paul Agranoff presents a fabulous workshop for Grades 5-6-7. We are especially excited about offering the 7th grade as part of the 5-6-7 section. Teachers will have to decide depending on their class’s ability level or their needs which class they should attend. All of the presenters bring many years of successful educational training with thousands of teachers! Barbara Ann Novelli is a gifted educator, who has shared her enthusiasm and easily applied ideas with thousands of teachers. Their comment is usually “Wow, I can use these ideas the minute I get back to my classroom. My students will learn while loving learning.” These ideas come from working in the classroom for over 30 years. Barbara is a teachers’ teacher, having worked with classroom teachers as well as teachers who are earning their credential at the college level. Her expertise in the area of math and science has helped her in many distinguished positions: a writer and trainer for AIMS Education Foundations, University Professor teaching both the Math/Science Methods courses, Director of Curriculum and Staff Development and a finalist for the Presidential Award in Mathematics. Barbara has written many articles about teaching mathematics and science to young learners and her new books, An Amazing Array of Math Games and Over and Over: Repetition for Reinforcement of Mathematical Concepts and Skills are now available. 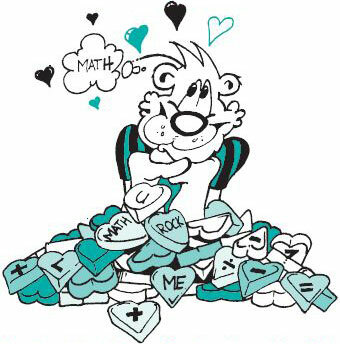 You will experience some of these new games in Love Teaching Math! It is important that children in pre-school, kindergarten and first grade be given significant early math­ematical experiences. Research proves that these early experiences have long-lasting outcomes in student achievement. During this action packed 2-day class, you will explore exciting ways to provide the rigorous yet child-centered mathematics that will truly enhance your student’s future math success! Barbara provides fun, developmentally appropriate math activities, music, games, and books to help guide your young learners through standards for math content. You will walk away re-invigorated and ready to fill your year with new ways to teach math. Kim Sutton is a fabulous presenter, who has taught thousands of teachers the joy and excitement of “hands-on” math. Kim’s teaching experience includes over 25 years of classroom teaching and time as a regional math specialist and university instructor. Kim has worked with over 200 districts nationally and internationally as a staff development consultant. Kim has written many articles about pattern blocks, classroom management and is the author of Dazzling Dominoes, Let’s Get Started!, Algebra Express, Fractions: A Part of the Whole, Math Engineers, Math Focus Activities, Visual Tools, Number Line Workbook, Making Math Books With Children, The Powerful Numbers 0-100, Place Value With Pizzazz, Dynamic Dice, Do The Math, Math Drills to Thrill and The Power of Digital Root. Experience what others have learned—Kim Sutton is a dynamic, extraordinary educator whose enthusiasm and love for teaching are contagious! She gives you practical, easy to implement information and ideas that you will use for years. This 2-day workshop will be filled with strategies for teaching a balanced math program using math routines, games and higher level thinking as the foundations for building strong number sense with grades 2-4 students. From this Kim Sutton will cover all the strands building on strong number sense. You will leave with many strategies and materials that are ready to use! Come prepared for two action-packed days of literature, music, dance, game playing and more! Paul Agranoff is a 27 year veteran of the middle level classroom where he has taught fifth, sixth, seventh, and eighth grades in elementary, intermediate, middle school, and junior high settings! Paul has chaired and been a member of the mathematics projects at the local, state, and national levels. As a workshop leader, Paul has been involved in presenting classroom best practices to thousands of teachers all across the United States and Canada. Students have traditionally struggled with understanding rational numbers and ge­ometry. In rational numbers, students have difficulty with interpreting the meaning of fractions and decimals as well as using them to solve problems involving operations. Geometry is a rich topic, but can be difficult to build student understanding beyond definitions and vocabulary. Paul does a great job in this 2-day class helping teachers explore problem solving and number sense with rational numbers while learning instructional strategies to develop student thinking. You will explore these subjects through hands-on activities that build meaning and understanding. Credit from Humboldt State University is available for an additional charge. These credential/licensure courses offered are designed primarily for elective or professional development purposes.